Project renderings are by Harris A. Sanders Architects. The proposed redevelopment of the Playdium site in Albany is set to move forward after the Albany IDA approved a PILOT agreement and tax breaks for the project at a special meeting Thursday. 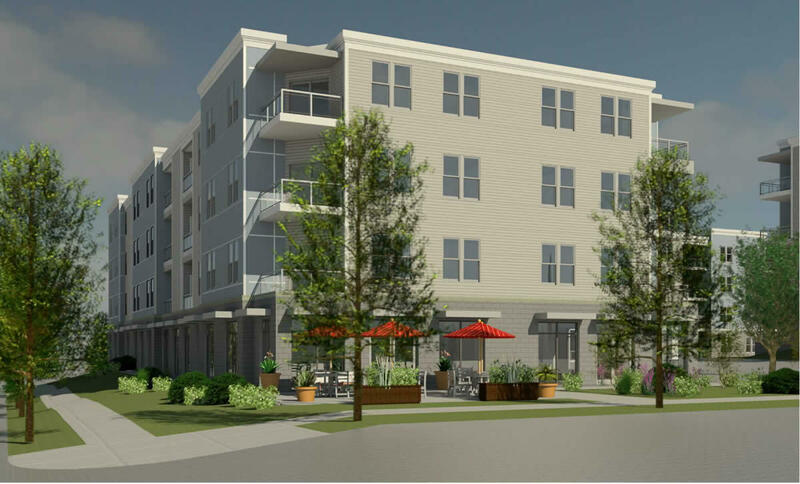 The project -- backed by the Jankow Companies -- involves demolishing the bowling alley to make way for the construction of three new apartment buildings. The proposal has gotten a lot of attention because it's set to replace a neighborhood landmark. 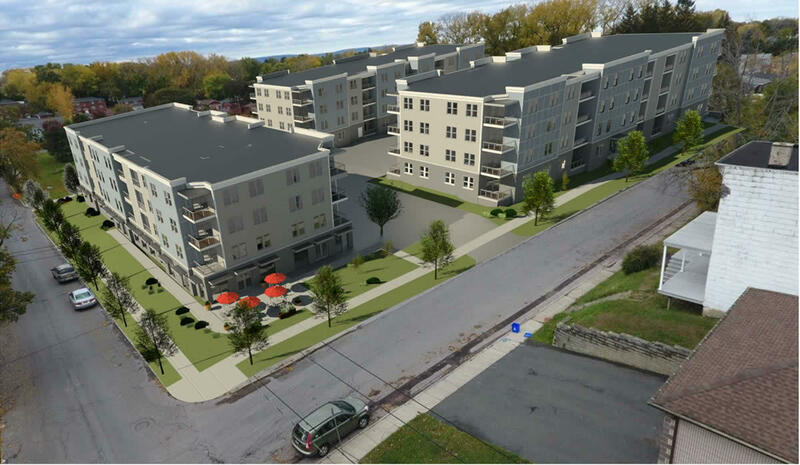 And it's become a high-profile example of the simmering discussion in Albany about the density and height of new development around the city's neighborhoods. The developers have a tentative closing date in early April, according to real estate agent David Phaff, who's been representing the project. Construction would start immediately after. + Rents ranging from $1,200 for a 1BR apartment up to $1,600 for a 2BR. There's a set of renderings at the top in large format -- click or scroll all the way up. 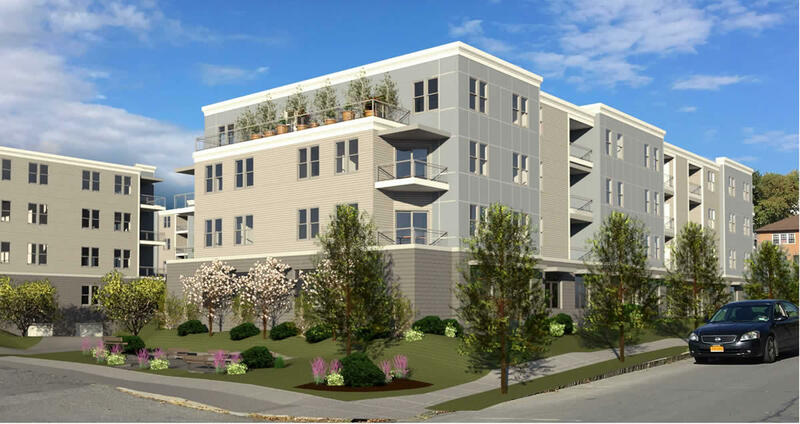 The project has faced pushback from Common Council member Judy Doesschate, whose ward includes the site, and some residents of of the surrounding neighborhood in large part because of the apartment buildings' four-story height, which required a variance from the city's board of zoning appeals. Doesschate and others argued before the BZA and city planning board that the height was out of scale with the surrounding neighborhood. Here's a recap of the back and forth, which included support for the project from the Pine Hills Neighborhood Association. The planning board approved the development plan for the project in February. The PILOT schedule for the project. (Yep, there's no way you can read it at that size -- click the image for a larger version). That left working out an arrangement with the Albany Industrial Development Agency as the last step before the project would move forward. The PILOT includes an estimated $4.8 million in payments from the property owners over the term of the agreement. That's estimated to be about $3.6 million more than if the Playdium site continued as is. And it represents an abatement of $6.9 million from the estimate of what the new project would pay at the full rate from the start. The package of incentives also includes exemptions for an estimated $696,000 in sales and mortgage recording taxes. As with the design of the building, there has been some pushback on the package of incentives, again primarily from Judy Doesschate. She has argued the projected rents for the apartments -- ranging from $1200 to $1600 per month -- are too low (she points to higher rents at the new Park South apartments) and, in her view, the PILOT arrangement is essentially undercounting what the revenue from the project will actually be and as a result the incentive is sweeter than it needs to be and the city will be missing out on its fair share. At Thursday's IDA meeting, Capitalize Albany's Joe Landy told the board the numbers for the project didn't appear to be outliers. He said the Playdium project's average rent per square foot for units is $1.35. And he pointed to an analysis of rent data covering more than 300 units across 11 projects in the city that indicated the average rent per square foot for those projects is $1.47, with the most direct comparison to the Playdium project being the Elefteria on South Allen Street near St. Peter's. Landy said rents there started out at $1.25 per square foot and have since risen to $1.35. The estimated rate of return on the investment for the project over the first 10 years is 12.42 percent, Landy told the board, which falls within the 12-14 percent range he said the IDA usually uses as a guideline. Albany city treasurer Darius Shahinfar, who sits on the IDA board, spoke briefly ahead of the vote on the incentive package. He pointed to the estimate that the PILOT will result in the city getting more than $3.5 million in additional tax revenue than it would if the Playdium continued as is (and possibly even more than that if the Playdium became vacant). And he said the new development would be up for assessment after it opened, providing another opportunity for the city to get a read on its actual value. Shahinfar also noted that the current owners of the Playdium have said they plan to close the business regardless of what happens with the proposed development, and he said he feared what would happen to the site if it became vacant. "Given that those are our choices here," he said, referring to the new development versus the planned closure of the bowling alley, "to me I think the choice is clear." The board unanimously approved the package of incentives in a voice vote. If you're interested in the history of the Playdium -- and bowling generally in Albany -- check out this interesting backstory over at the Friends of Albany History. I thought there might have been some wiggle room on the size of the abatement, but there's no question the project needed a PILOT to move forward. I never like to see MRT waived for residential because 1/5 of it supports transit. At any rate, I'm glad this is past us and optimistic about the investment. Keep in mind that the project's average rent per square foot for units will be $1.35 at the start. As the PILOT increases, so too will the rents because that will need to rise to keep up with the triple net that will include property taxes. The rents will rise. There was speculation that the Developer could charge $1500 for a 1BR and $2000 for a 2 BR and avoid the PILOT, but I doubt that would ever fly on day one for this location. Just two blocks away is my 3br house with off street parking. I would be wasting my time trying to get $2k for rent. BTW, those "AMC" apartments (Tri City, really) got a PILOT, too. They're rents should be increasing but are set lower so they could take root. Finally, it's not just about jobs on site. It's about jobs off site, too. With at least 110 new residents, the development gives me great hope about vacant storefronts on Ontario, New Scotland, and Madison. I'm glad that Darius pointed out that the Alley was closing and the death of jobs because of the development was a weak cause for alarm. The alley's closure will eliminate ALL the jobs in the building. And when it closes, what benefit to the neighborhood will be had? Sweet! A derelict bowling alley. That would have really been a boon. Overall, I think this is great for the neighborhood (in terms of occupancy and density) and for the city (in terms of revenue). I've never see a clearer presentation of reasons for determining whether a PILOT incentive is fair and in the interests of the city. AOA - you elevate the conversation! Broken record: How about some units affordable to people who are at lower incomes along with that PILOT? There are plenty of people looking for decent quality housing in Albany who can't afford those rents. I do not believe that low income people are in any way being priced out of Pine Hills. In fact, I'd venture a guess that PH is well below the 50th percentile for average price per sq. foot for rents. There's a $675 / 1br - Furnished 1 Bedroom for Rent @ 532 Warren Street. $875 would get a two bedroom at 54 S Main Ave w/ heat included. $1500 gets just about any 3br in the neighborhood. I agree that for projects getting a tax abatement, a portion of units should be set aside with household income limits. However, if we want lower rents with affordability requirements, we're going to have to be comfortable with even larger PILOTs that would be needed to make the numbers work for these developments. If we're going to expect that developers can build these types of developments, and offer a 1br for $675, they're going to take a bath on the remaining $500 a month that the Playdium is charging. Where does that $6000 a year come from? It's got to come from a PILOT - and there are council people on record fighting PILOTs because they perceive $1200 for a 1br in PH as being TOO LOW a rent. I just think the design is poor. I would have like to see more effort made to fit the neighborhood aesthetic. I know the area has a hodge podge set of styles but the overall city has something better than this. This looks like they took design cues from the Times Union Center better known as the Tuna Can when it was built. Thank you Martin for laying out the facts on this particular project and IDA development in general. I also want to point out that the City and the IDA have an enormous investment in affordable and low-income housing via the Albany Housing Authority, private developments like Ohav Shalom, the VI apartments, Livingston School apartments, and most recently at the IDA, approval of the renovation of over 70 brownstones in Arbor Hill. All are affordable/low income, and all of which make payments to the tax coffers based on rental income percentages. We have literally thousands of affordable units in the City, including Section 8 housing. Personally, I would love to see more supportive housing outside Albany as well, so we aren't stuck with as much of the legacy of poverty foisted on cities and Albany in particular by redlining, institutional racism, and a host of corporate, private, and federal, state and local governmental policies. Agreed. Would you like to see the design guidelines for the form based code overlay districts in REZONE applied more broadly? There's been some pushback that the form based code has been TOO restrictive. I'd love to know people's thoughts. In reference to Steve's comment about the poor design: Well, beauty is in the eye of the beholder. I for one, and many of those who commented before the Planning Board, like the design. There is no image in that 2 block squares area; the design proposed gives the area some positive focal point. The balconies, large windows, and 1st floor treatment create a positive image for the area. The design is so much better than the original proposal of a mansard roof and all brick facade with windows "punched in" that were too small. The tax exemptions are an absolute joke. Totally unnecessary. Please, someone figure out how to get rid of IDAs in this state. They are a cancer. All they do is take money from homeowners and give it to developers. Don't we wish we could have a Wegmans.....Best large grocery market in the US....BUT, a grocery store at this location would be inappropriate--would create real traffic problems on all the streets.